In the early 1500's 'horned' cattle from Spain came to the Americas. Migrating through Mexico, eventually into what is now known as Texas. The ancestors of these Spanish Cattle became the Texas Longhorn. During the 1800's large herds were driven through Colorado under the watchful eye of Col. Charles Goodnight. The route, that eventually became known as the Goodnight-Loving trail passed to the east of Colorado Springs on the way to stockyards in Denver and on north. While many herds have sprung up around the state of Colorado, displaying some of the best horned, colorful, cattle in the country, Silverado Ranch found it's own niche in the business. We have spent over 40 years designing a genetic plan that has resulted in unsurpassed Color, Horn growth, Meat quality and Disposition in our herd. 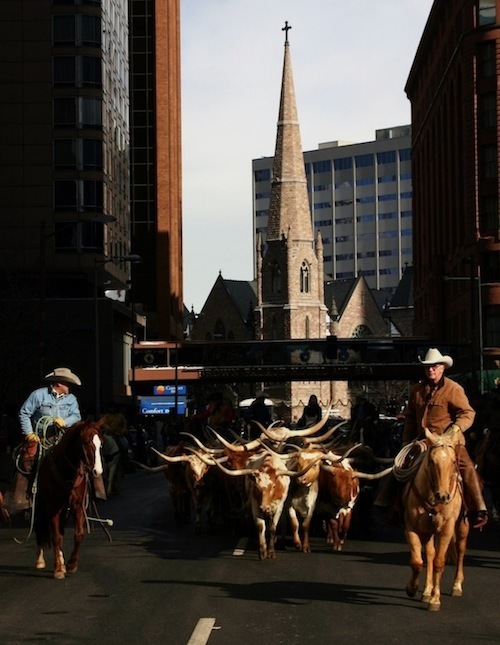 If you've been in Denver, around Stock show time, you may have seen a "Blast from the Past", as ranch cowboys from around the country, drive Silverado Ranch Longhorn Cattle down 17th Street through Downtown Denver in January to the delight of nearly 40,000 onlookers. Starting at Coors field and moving past Union Station right to the heart of the downtown business district. The 'Downtown Trail Drive' has attracted so much local and national attention that the Longhorns on the street have become the promotional icon for the National Western Stock Show.